A major goal of FDBD is to provide the very best fire prevention and safety education to citizens to ensure they have knowledge about how to prevent and defend themselves against fire and other disasters that may strike at any time. Below is a list of educational programs that are available to the public at no charge. Please contact the Fire Department at 261-0083 to learn more about these programs or to schedule a training date. The Public Education Office of the FDBD offers Fire and Life Safety programs for students and residents. 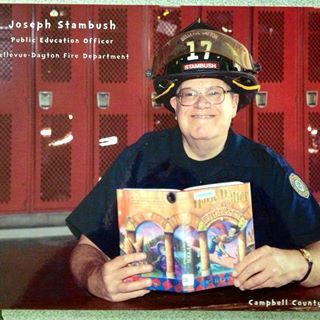 These programs, provided by Public Education Officer “Fireman Joe,” offer educational opportunities in fire safety, home escape planning, seasonal and holiday safety tips, and numerous other topics designed with topics for all age groups. Our Public Education Office has public speakers for specialized topics tailored for your group’s needs. Fire and Life Safety pamphlets also are available for distribution. Videos and DVD’s on Fire and Life Safety topics may be loaned to individuals and groups by contacting the FDBD Public Education Office. Public tours of the Fire House can be arranged for any size group or family by calling us in advance. Fireman Joe coordinates and manages “Facility Safety Day” twice a year at local Senior Citizen apartment buildings and assisted living facilities. The Home Safety Council Senior Awareness Program is also available to groups and individuals at your site or at the Fire House. Educating employees in Emergency Evacuation Planning, How to Operate a Fire Extinguisher and How to Handle Emergencies in Hotels and Healthcare Facilities are just a few of the educational classroom programs your Fire Department provides to our business community. Classes can be held on-site or in the Fire Department’s Training Room. CPR and Basic First Aid are available to individuals and groups by appointment. There is a small fee for individuals who want certification certificates for these classes. To schedule an individual or group class, please call the Fire Department at 261-0083. The Juvenile Firesetter Prevention and Intervention Program is designed to protect communities from the dangers of a juvenile firesetter. Firesetting is the largest cause of home deaths among children. Approximately 70% of fires in the U.S. are caused by children under the age of 10 years old. Once a fire is set, it takes about two minutes for the flame from a single match to set an entire room on fire. Juvenile firesetting is a very serious community problem, and the FDBD hopes to lessen the problem through this very valuable program.